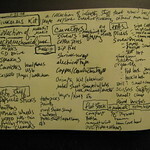 These are ideas for an open source kit to encourage people to tinker with common systems and junk. Included would be a decent collection of stuff, organized to be attractive to both male and female. The target age would probably be in the early teens, middle school or so. Because the kit would be pretty open ended in its possiblities, it could be used satisfactorily by curious people of all ages. video sample of the idea.